Yep, believe it or not, these luxe looking lighting options are affordable, too. Nothing is better than getting a compliment on an affordable design element. We smile at the compliment and reply with something along the lines of, “Thanks, it’s from Target!” The “No way!” or “Are you kidding me?” that follows is music to our ears; proof that the affordable item looks the part, too. With a little sleuthing, there are plenty of well-priced home items that only look expensive. Perhaps the best category of good looking items at affordable price-points is lighting. Plenty of brands have dreamt up awesome floor lamps, en mode pendant lights, and trendy desk lamps that won’t cost you an arm and a leg. So, without further ado, meet 15 super luxe lighting options that all ring in under $150. Fair warning, it’ll be hard to resist the urge to buy them all. This sleek, clean, minimalist lamp has a lot to offer at a very low price tag. For one, this lamp illuminates in a surprising way. When you lift the lower ball attached to the cord, it attracts to the top ball (due to magnets inside each) creating a connection that then turns on the lamp. Separating the wooden balls turns the lamp off. This lamp is a cool conversation starter that also looks sleek, minimal, and more expensive than its price tag. What’s more is this lamp also has a USB plug to charge your various devices. If that isn’t a steal for just under $60, we’re not sure what is. This modern lamp is super stylish and the perfect of-the-moment choice for a desk, dresser or nightstand that could use a little more illumination. Hard to believe that it rings in for under $100 with its chic metal base and glass lamp shade. Okay, we need to take one quick moment to honor Target for their lighting collections. Their chic options look super luxe in person and sit at extremely affordable prices. This floor lamp is one of the many amazing options Target currently has to offer. If you’re looking to totally revamp all the lighting in your house, there’s more where this came from. We’re including this pendant for three reasons: it’s super chic, it’s affordable, and just to further prove the point that Target has a ton of lighting options that look luxe but are super affordable. It’s hard to find solid pendant lighting with this design quality at this size for this price point. Give your room a custom feel with this super cool flush mount. The gold ombre finish will bring elegant warmth to any room. It’s hard to believe the low price tag on such an elegant piece! Chic, deceivingly affordable lighting doesn’t have to always employ elegance. This Miffy light is a pop culture icon that feels like a piece of art. Add an upscale, yet whimsical touch to a kid’s room, or to an adult’s living room with this glowing lamp. This super cute, compact lamp is great for small spaces that need just a touch more light. With its unobtrusive design, this table lamp will seamlessly fit into any room. We’re digging the grey and white marble option. This beautiful-yet-cool pendant lamp is made with high-quality brass and a glass shade. The lamp is built to order to your custom specification in the brand’s Portland, Oregon factory. A chic semi-custom option for far less than $150 is a deal if we’ve ever heard one. There’s something fun, and inherently cool about iridescent accents. This lamp is no different. With its gleaming glass base, this lamp looks upscale. Add this piece to a monochrome, minimalist room and let it really stand out. Minimal, clean lines make this lamp a beautiful choice. The white marble base grounds the lamp, subtly connecting lamp shade to base. This table lamp is a sure statement that will upgrade any room. The beauty of lucite decor items is that they are transparent by nature. So, if your side table or desk feels too cluttered, try opting for a lucite lamp that will inherently maximize your space. It’s hard to find awesome floor lamps at great prices. This sophisticated floor lamp checks both boxes. Place this versatile lamp in your entryway, bathroom, bedroom, or living room. Concrete accents are low-key, chic, and super cool all at once. This table lamp employs concrete in all the right ways, adding a stylish touch to your living room, bedroom, or home office. 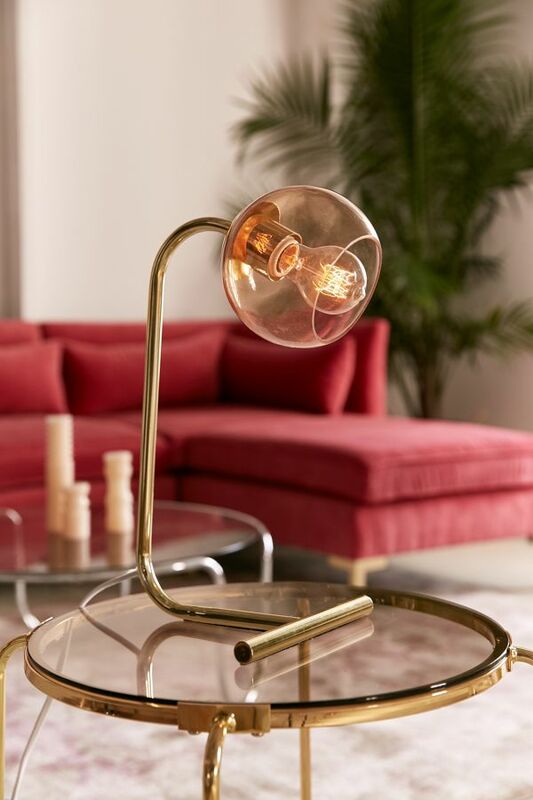 Italian decor brand, Kartell curated a selection of luxury home items for Barneys New York, including this fun lamp. The blue polycarbonate table lamp mirrors the shape of a classic bedtime lamp while totally transforming the experience at the same time. When the lamp is illuminated, the light reflects in a playful manner, making this a special, design-forward piece. Yes, it’s possible to find a solid and sleek floor lamp at a price well under $100. This option is made of metal, giving your room an on-trend, modern touch.